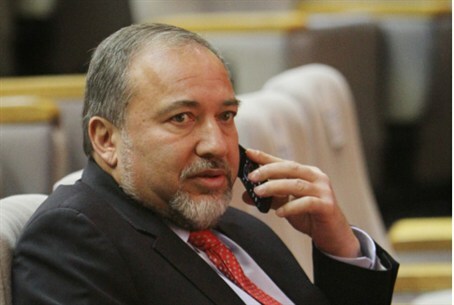 FM Avigdor Lieberman says Defense Minister Ehud Barak's policies are making it impossible for coalition parties to live with one another. Foreign Minister Avigdor Lieberman said Wednesday that the expulsion of 15 families from Beit Hamachpela ("House of the Patriarchs") in Hevron could bring down the government. "This policy is undermining the coalition's stability and hampers the ability of the various coalition parties to live with each other," Lieberman said, referring to Defense Minister Ehud Barak's decision to violate an agreement to delay the eviction until April 26 – after the Passover holiday. The "handling the case of 'The Patriarchs' in Hebron – from start to finish – has been wrong both substantively and politically," Lieberman explained. "The policy of the Ministry of Defense towards Jewish settlement in Judea and Samaria is designed to inflame passions rather than to meet the security needs of Israeli citizens who live there," Lieberman said. Lieberman also said the only way to stabilize the coalition was to strip Barak of his authority over Judea and Samaria, transferring them to a special ministerial committee that would "accurately reflect the majority opinion in the government and the public." His remarks echoed similar sentiments expressed by ministers from the ruling Likud party. He also used Beit El's threatened Ulpanah neighborhood to underscore the inherent dissonance in Barak's position on Beit Hamachpela. "You cannot cite the sanctity of property rights to evacuate an entire community that was established 13 years ago, while not respecting property rights when it comes to a legally purchased a house in Hebron by Jews," he said. Last night, at a toast in honor of Passover [an Israeli custom in the workplace before Passover and Rosh Hashanah] Lieberman said that he would dismantle the government if controversial issues like "The Patriarchs" in Hevron, the Tal Law, and high housing costs are not properly resolved. "Anyone thinks that we are held hostage by the legal processes is wrong," Lieberman said.